A bowl of beany vegetarian deliciousness! 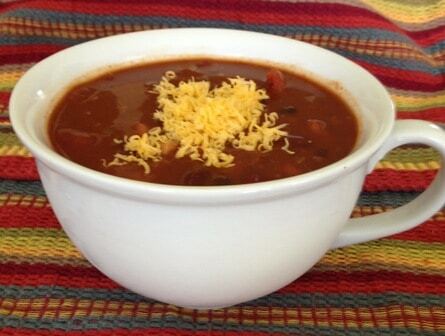 This ingredient list for this chili is simple, and preparation couldn’t be quicker. Four kinds of beans mean a protein power-punch in every serving . Not a fan of pinto beans? Can’t stand cannellinis? You can easily substitute more of one kind of bean for the one(s) you don’t like. Some vegetarians do not eat traditional Worcestershire sauce because it contains anchovies. While vegan Worcestershire sauce is available, if you can’t find any feel free to substitute soy sauce or balsamic vinegar, or just leave it out all together. Add onion and garlic; sauté 3 minutes or until tender. Stir in sugar, chili powder, Worcestershire sauce, tomatoes and all beans. Whisk tomato paste into remaining 1 cup water. Stir tomato paste mixture into bean mixture. Bring to a boil; reduce heat, and simmer 20 minutes or until thoroughly heated. 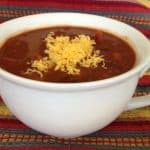 Serve chili in bowls and add your favorite chili toppings (cheese, onions, etc).